I am mainly a guitarist that fool around on the bass for recording purposes , this makes my cheap hundred dollar bass sound pretty decent ! The Eden bass amp is my current favourite of UAD's bass lineup. I was almost certain I'd grab the Ampeg bundle (they also sound great) but the Eden emulation is extraordinarily rich and characterful. It's more versatile than I was expecting, too. It can push out a really tight and refined low end (I tend to prefer being restrained in the lows, and play mostly through my bridge pickup). It sits really snugly in my mixes. It also offers some nice distorted tones—again, great when you want something that isn't overwhelming. All in all, not the kind of tone I saw myself using, but I'm glad I've now discovered it! Whats not to like ? about this setup. Rich quality bass, Softube's secret weapon sauce, Uad platform invitation... Unison. This is a fantastic option to have, for bass, kick primarily, but search further & you will reveal a wide range of textures that will inspire you. easy to adjust, special the Bi-Amping Mode. I am using from time to time. My favourites are the Ampeg Simulations. For me their sound is with more charackter and punch. Flexible with fast and fat results. Makes a great counterpart for more modern tones and for a lot of different sonic territory. It is easy to tweak this to generate most of the tones I am trying to go for, and the presets actually give usable launching points for a wide range of styles. Pretty much just using this and the ampeg and covering my needs. I was not really sure what to expect - my bass playing partner was using this on a track and it flagged that I did not have the plug-in. So I listened to the track for a few months trying to get my head around the guitar parts - these parts were tightly aligned with the bass. I struggled because the bass kept disappearing into the rest of the track, so I got the bright idea to try the Eden demo. I bought it about ten minutes after trying the demo for the first time...this is an excellent plug-in! Nice Surprise..I Couldn't Be Happier! I'm surprised this amp doesn't receive more love. It covers a wide variety of tonal options, however I really like it for its modern sounds. The presets are very good and in many cases will be all you need. I primarily produce Hip Hop, R&B, Funk and Pop. I rely on the Eden WT800 amp and the Ampeg B15N for all of my bass needs. The Apollo with its Unison technology, continue to surprise and deliver excellent quality. Excellent Bass Amp. Don't forget to use it at 96Khz ! It changes everything. Tried the others, this is the best. I really enjoyed this fantastic plugin for my bass... just simply and powerfull! I added this amp to a project that was already underway, with bass that had already been recorded. As soon as I started playing through it, I captured the entire track with more finesse than the original. It sounded sooo good that it made me lay down a hotter track on a single take, and I had just been trying it for fun. Like when you pick up a better quality instrument than you've ever played before and it lets you play licks you have never been able to before... that's what the Eden plug is like. A Varied Workhorse. From The Clear Blue Depths To An Aural Affront. A great unit. I know Ampeg is considered "De Rigueur" but why try to sound like every bassist since 1970 with a fender Jazz? Really, it IS the 21st century, you know. No - this is an extremely accurate unit for those wishing a high quality individual sound - something for you Warwick girls and boys perhaps...Or maybe those Active Ibanez 6 string bangers....(guilty, your honour). This unit goes from subtle: "my bass only now I'm deaf" amplification to that big scooped new slap sound for the technical Alembic darlings: from Folk to Pop to Rock to Metal. All with tremendous clarity and focus. This amazing emulation is perfect for me, so of course it will be be for you too. YES, the Ampeg is Nice all Wooly Cardigan soldered to old slippers, with a Ration card emulation switch for this weeks Mutton. No Sir. Not here. Give me a Modern sound for a modern age dady'o. Don your Skull Helmet as you lead the Ravenous Hordes back through the wastleands of Threll, or tread gently through the group hugs and mystical sea cows in the Magical Forest of Bong. it's all here. Got Prog? Not without the Eden WT800 you don't. 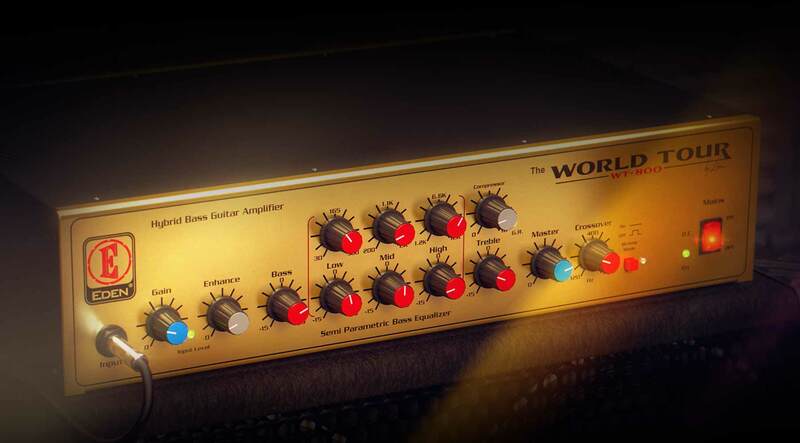 One of the best Amp Simulator ever played. Warm and real in response! I own all the UAD bass amps and this one takes it no contest. It's fairly modern but easy to dial in which is its strength. The mic placements just work and the blending of the different cabs and D.I. is missing from many amp sims. Taking off one start because the gain stage when used in unison slot is complete garbage, on my passive passive basses I have to dime the gain and master to get -9db peaks.